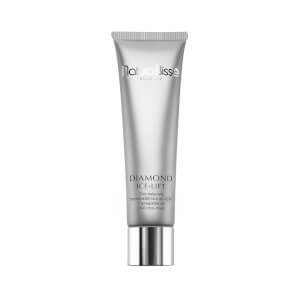 Discover a new dimension of radiance with the Diamond White Glowing Mask from Natura Bissé. The creamy mask is designed to reduce the appearance of pigmentation, resulting in a bright complexion that visibly glows. Ellagic acid in Pomegranate extract provides a powerful anti-oxidant with depigmenting action, effectively evening the appearance of skin tone. Enriched with Betaine, the formula also hydrates the skin, whilst preventing hyperpigmentation. Luminosity, hydration and elasticity is restored. Use the mask once or twice a week, depending on the skin’s needs, after cleansing your skin and applying toner. Apply a thick layer on face, neck and décolleté. Leave on for 10-15 minutes. Remove the product with warm water or with moistened facial sponges.